Renovating in France can be a deeply satisfying experience and the renovation of ‘Maisonette Pierre’ in the Cognac area has been no exception. I am now at last ready to complete the final installation of fixtures , furnishings and accessories with the extensive and lengthy building works program finally completed. 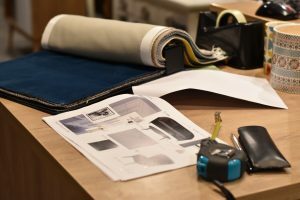 Since my last project update which you can read here, various artisans have been hard at work putting in place the various decorative features which make up the key elements of the design. Most important of these has been the installation of the decorative Paris wall mouldings, cornices and architraves. This was an especially challenging part of the project since ancient French houses are not known in any way for being precisely square or plumb. 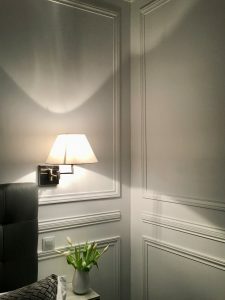 Whilst this did not pose a problem as far as new ceilings and internal walls were concerned, careful attention was needed for the application of the mouldings to the original stone structural walls and for the skirting boards sitting atop the original chestnut floors. The complete re-wiring and re-plumbing of the house has resulted in the perfect concealment of all pipe work and electrical cables and the installation of modern LED downlighting, feature wall and pendant lighting and new power sockets and switches throughout. 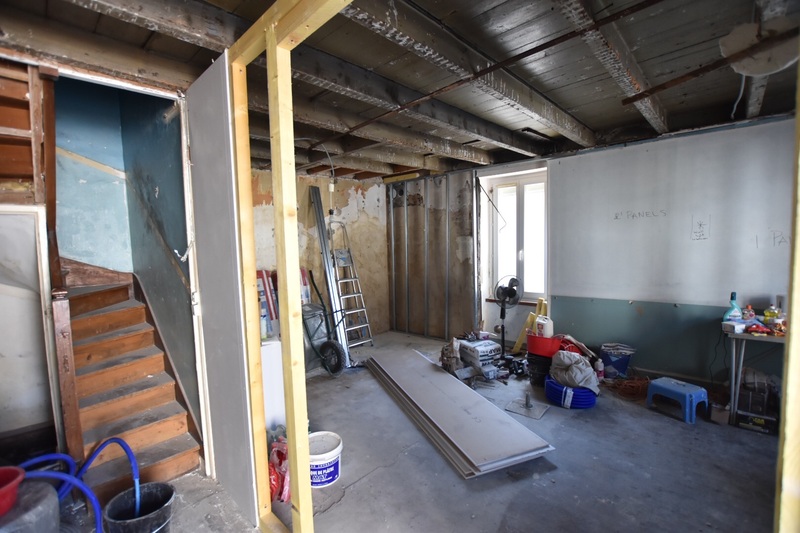 This is a hugely impactful shift from the pre-renovation days of the project when all the plumbing and electrical cables were exposed, being positioned on the outside of walls and when the various rooms were lit by just one lightbulb suspended from the ceiling by an ancient cable. Our talented master painters have beautifully picked up the detail of the various moulding and architrave patterns, have made a wonderful job of the ebony and white staircase and of restoring the ancient French doors that were found in a reclamation yard and which are now a major feature of the entry hall and living room having been finished in a striking ebony paint. We are very excited to receive the delivery of furnishings, artworks and accessories in just two weeks time. Most pieces were selected from local suppliers in Cognac during the second half of last year and have been in storage while the building and fit out works were completed. I chose tones of silver and grey for the complete collection and these tones are represented in materials including carrarra marble, glass, chrome, New Zealand wool for area carpets and curtain and upholstery fabrics which are exclusively luxurious velvets and silks. Included in the shipment is an art deco inspired dining table finished in bright white lacquer which incorporates a decorative panel in black designed to mimic the moulding pattern on the doors to the hidden kitchen and the walls. 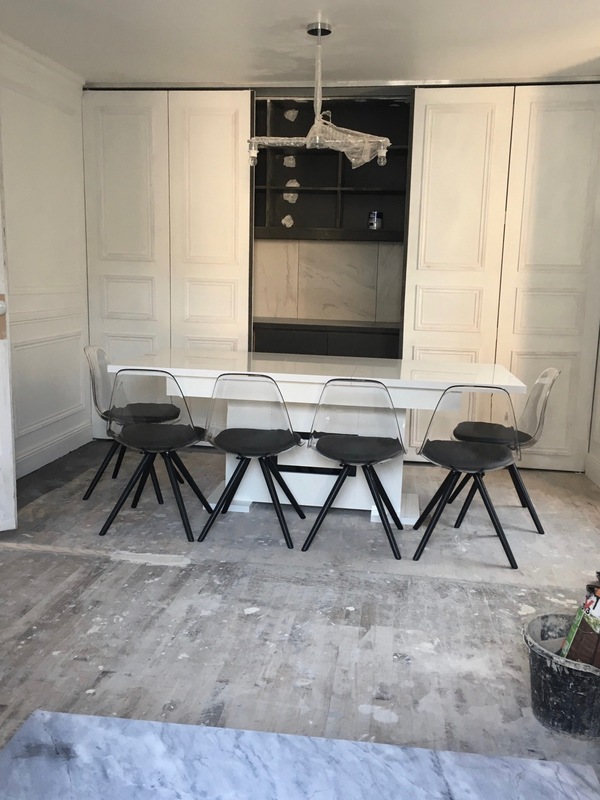 The table will serve double duty as an island and has been partnered with early 1960’s inspired dining chairs made from moulded acrylic in a smokey grey tone with simple Danish designed legs in dark ebony. Positioned nearby will be a traditional Chesterfield sofa, deeply buttoned and upholstered in an anthracite velvet fabric – the perfect foil for the contemporary style of the dining chairs. Overall, I have endeavoured to subtly mix period styles and shapes to achieve a visually interesting combination which will perfectly offset the chic and elegant impact of the monochromatic colour scheme and the decorative mouldings applied to every room in the house. I am very excited to share with you in the next few weeks the interior photographs of ‘Maisonette Pierre’ just as soon as the final installation has been completed. 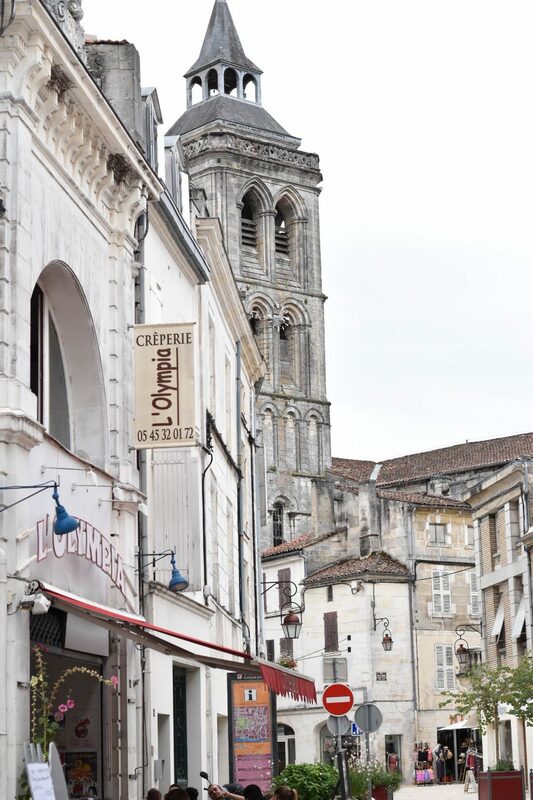 Are you undertaking a renovation in France? Contact us to discover how our interior design and renovation services can help.